Cassius Winston took another official visit over the weekend as he traveled to Pittsburgh, and he’s also made some adjustments to his fall calendar involving his previously scheduled Michigan official visit. Cassius Winston took another official visit over the weekend as he traveled to Pittsburgh, and he’s also made some adjustments to his fall calendar. Winston will visit Michigan State next weekend for the Spartans’ football game against Oregon. Reports surfaced early on Monday that Winston would then move his Michigan official visit to September 26th rather than the originally scheduled September 19th date, but even those plans appear to be uncertain. MLive’s Brendan Quinn reports that Winston is unsure if and when he will take an official visit to Michigan. Now Winston says he’s not sure when he’s visiting Michigan. Winston is expected to decide between Michigan, Michigan State, Pittsburgh and Stanford before the start of his high school season. He has been the top point guard target on Michigan’s recruiting board for the majority of the last two years. Michigan also has official visits setup with Miles Bridges (October 12th) and tentatively with point guard Bryce Aiken (October 8th). Four-star wing guard Kevin Huerter is officially off the board after committing on his official visit to Maryland over the weekend. Huerter had previously planned a Michigan official visit for the coming weekend. The Wolverines had watched Huerter carefully during the spring and summer, but hadn’t offered a scholarship to the 6-foot-6 guard who had yet to visit Ann Arbor. Huerter visited Villanova and Maryland before making his college decision. Michigan had been exploring the potential of Huerter as a class of 2017 prospect, but he opted to go with the class of 2016 offers that were available. With Cassius Winston’s visit in flux and Kevin Huerter off the board, Michigan is looking at some tough decisions with respect to its 2016 point guard recruiting. Payton Pritchard and Huerter are both off the board while Xavier Simpson will announce between Miami, Illinois, Iowa State and Wisconsin on Wednesday. Four-star point guard Bryce Aiken has discussed a tentative official in October, so he’s an obvious backup candidate. But the point guard prospect other than Winston who might have received the most attention in July was Milwaukee guard Te’Jon Lucas. Lucas visited USC officially and is scheduled to visit Old Dominion (next weekend) and Memphis (the following weekend) officially. 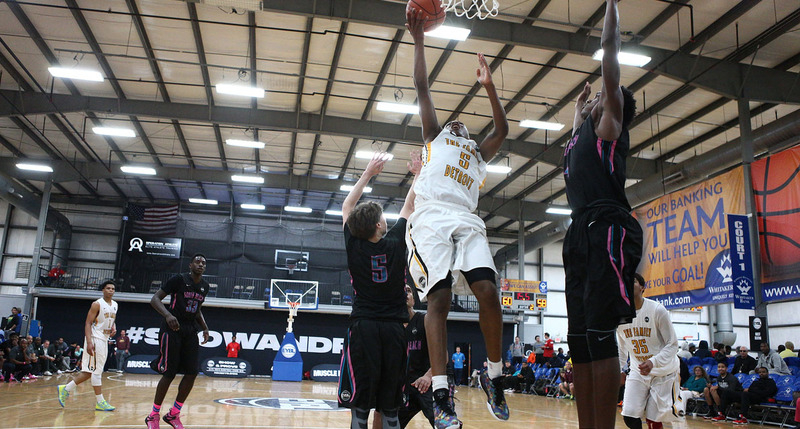 He’s also discussed an unofficial visit to Michigan this month. With the news surrounding Winston, Lucas could be the point guard target that the Wolverines start to prioritize sooner than later. Class of 2017 wing forward Kyle Young will visit Michigan this month. Young will also trip to Purdue and Butler. Young is a 6-foot-6 forward from Massillon, OH who is ranked 135 nationally according to 247Sports Composite.